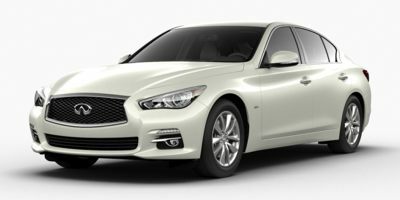 The 2017 Infiniti Q50 is very aged compared to its rivals in a luxury sport sedan class with some strong competition. Yet with that age comes wisdom, which is evident in the Q50's excellent interior experience and timeless exterior appeal. We have a few beefs with the Q50, but not as many as would be expected of a sedan whose design is past middle-age model years. However, Infiniti has kept the Q50 relevant with its sporty engine options and updated infotainment. This year the Q50 sees only a few changes, including the addition of the Sport and Sport AWD trims for the 2.0t and a little option shuffling throughout the lineup. The Q50 is offered in four model variants, each with a different engine as its primary delineation: the 2.0t, 3.0t, Red Sport 400 and Hybrid. From the outside, the 2017 Q50 is a great looker that stands out in the midsize luxury sedan segment, with its timeless curves. The understated front grille, hawkeye headlamps and fast-paced upward curve on its hood all make the Infiniti Q50 a stylish statement of luxury. Bold lines along the hood and upper fenders move along to become the front pillars and beltline, with the latter ending at the rear fender in an understated hump. The simplicity of the Infiniti design carries a lot of class. The added chrome accents add some bling without making the Q50 look gaudy or brash. In our opinion, the 2017 Infiniti Q50 is one of the best-looking sedans in the midsize luxury segment, despite not having been updated in years. 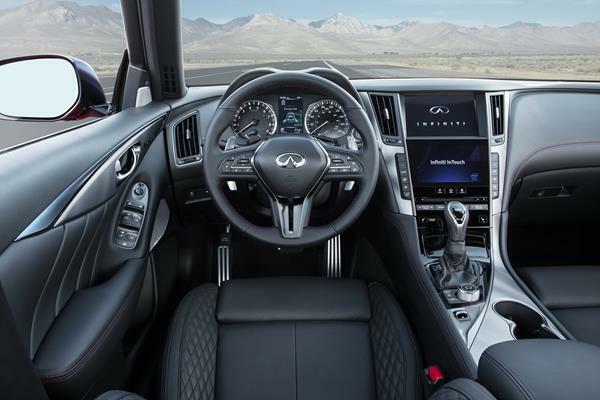 The interior of the Q50 is a mixture of excellence and last minute throw-ins. The overall quality is very good with excellent use of materials and quality workmanship. The dashboard is nicely curved and lifted to give an airy, roomy feeling and the cockpit layout gives easy access to controls. The glaring exception to this is the dual-screen infotainment system, which dominates the center of the dash. This is a good idea on paper, but in practice it needs to be reworked. The screens are prone to glare and finger smudging, and their functionality (addressed below) is sub-par. The dual screen setup feels as if it was forced into the car at the last minute and often glares brightly in the driver's eyes when the sun hits the screens or at night when they are fully lit. Seating and other aspects of the 2017 Q50's interior are superb, benefiting from a lot of subtle tweaks since the design was first introduced. A low step-in height and low bolsters on the seating mean easy entry and egress, while the wide-swinging doors help make this even better. 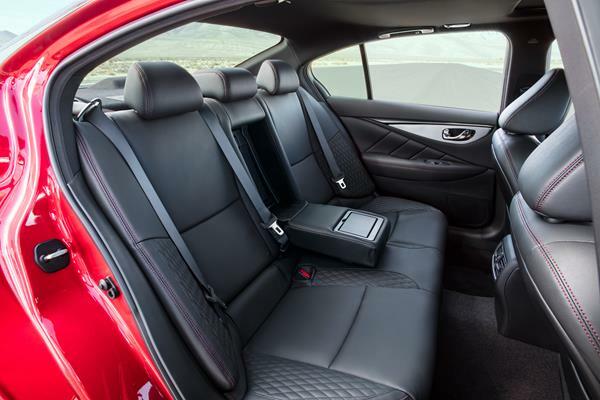 The front seating in the Q50 has plenty of room in all directions and the rear seats are unusually large for the segment. The big and tall will find plenty of room all around the Q50's interior. Cargo space is also good at 13.5 cubic feet. A wide opening and low lip mean easy loading and unloading. We recommend passing on the conventional spare tire option, unless you routinely drive where easy roadside assistance access is not readily available. Adding the spare decreases cargo space enough to be noticed. The technology in the Q50 is very good, but it's impeded by the car's dual-screen access for infotainment. As mentioned above, the screens tend to smudge and glare often, making them more difficult to use. Add to this their loss of intuitive use thanks to there being no facility for swapping controls or outputs from one screen to the next and the fact that some functions are on the lower screen while others are up top (some seemingly at random), it becomes more difficult to master the Q50's infotainment than it should be. Once this quirk is overcome, the Infiniti's infotainment is relatively simple to master and use. Infiniti has managed to keep the infotainment in the Q50 up to date with current expectations for the segment and we like the new InTouch interface for its fast response times and quick menus. Fuel economy expectations in the luxury segments are often subjective given the likely buyers' low valuing of such things. 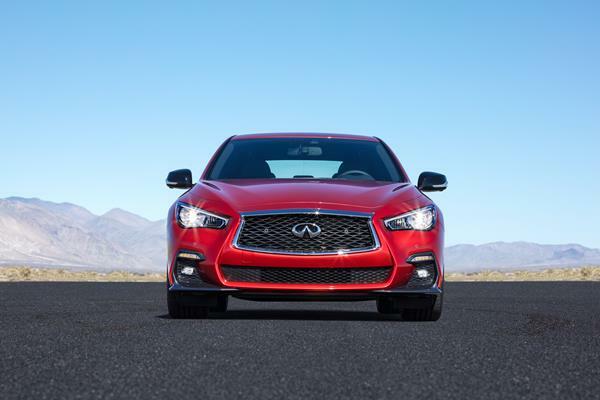 The 2017 Infiniti Q50 does well in its mainstream build, the 300 hp V6, but not so well in its 4-cylinder and high-end Red Sport 400 models. The 2.0t model is EPA-rated at 23 mpg in the city and 31 mpg on the highway, which is lower than most rivals with 4-cylinder engine offerings. The 3.0t model is rated at 20 mpg in the city and 29 mpg on the highway, which is more contemporary to the segment. The Red Sport 400 model is worse off (20/26 city/highway), while the Hybrid model, which should be the best in the lineup, is only rated at 27 mpg city and 32 mpg highway. The 2017 Q50 is barely rated as "Average" on most reliability measures. The J.D. Power and Associates Vehicle Dependability Study gives it a middling "About Average" rating and Consumer Reports gives it nothing better. A passenger airbag recall has been the only recall for the Q50 this year. The 2017 Q50 received top-most "Good" ratings for all crash tests done by the Insurance Institute for Highway Safety (IIHS), but has not been thoroughly tested by the National Highway Traffic Safety Administration (NHTSA) as of this writing. The Q50 did well in 2016 model year crash tests and is unchanged in terms of engineering since, so we expect that its 5-Star scores from 2016 will carry over to 2017, if tested. The Q50 comes with an impressive suite of safety items as standard or options, including blind spot monitoring and auto-leveling headlamps. The 2017 Infiniti Q50 has just about everything to like performance-wise. The base model is powered by a nicely-tuned little 2.0-liter turbocharged 4-cylinder engine that outputs 208 horsepower and 258 pound-feet of torque. The engine is peppy and quick on the uptake, though it lacks some of the muscular sound and higher-end pacing some drivers might long for in a performance sedan. For those concerns, Infiniti has two variants of its 3.0-liter V6 in the Q50. The first is the 3.0t, turbocharged to 300 horses and 295 foot pounds. This is a good middle-ground engine that has solid output throughout its RPM range and at most speeds. It's as quick on the uptake as the little four, but carries that muscle further through the gears at highway speeds. The other engine is the 3.0L V6 turbo'd up to an impressive 400 hp and 350 lb-ft. This resides in the Red Sport 400 model. This is a powerhouse of an engine that is perfectly right-sized for this sedan's size and needs. All of the engines are mated to a 7-speed automatic transmission that shifts smoothly and performs well. Tuned for the engine it's attached to, we enjoyed the transmission's fast movement and unobtrusive ways. Both rear-wheel and all-wheel drive are offered for the Q50. The chassis and steering for the 2017 Q50 are equally well-tuned for most drivers. The Red Sport 400 is tight and muscular, as expected, while the others are a bit more loose and comfortable - tailored to the luxury driver. On the highway, the 2017 Infiniti Q50 is smooth and well-mannered with plenty of oomph to pass and get around slower-moving vehicles. This oomph is even more noticeable as the trim levels and engines improve, but even the little four-banger spools its turbos and gets going fairly quickly in the passing lane. Although we haven't driven the Q50 Hybrid this year, past experience tells us that it will be less than interesting compared to the other three offerings and its fuel economy expectation is not likely worth the premium paid. The Hybrid model combines a 3.5-liter V6 with an electric motor to produce a total of 360 horsepower, but the car weighs more than its conventional gasoline siblings and delivers its power slower than that of the turbocharged mates. Two things work against the Q50 and in the buyer's favor. The first is dropping demand as the car ages, with sales slumping for the car compared to the 2016 model year. This means dealerships are more likely to cut deals to move Q50 models off their lots. 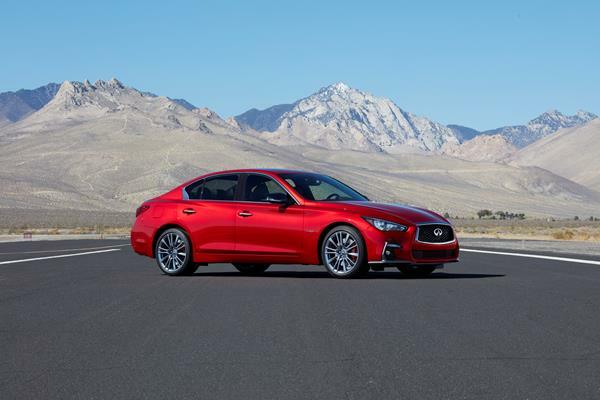 The other is a low starting price and an average middle-road price for the Q50 as its trim levels increase. The base model is cheaper than almost every other luxury sedan in its segment, but most buyers will be in the middle or upper trim levels, where the Q50 is more on par with contemporaries. Resale values remain low for the Q50, but most buyers tend to keep their cars longer than the average for the luxury segments, making used options older than that of competitors. Our advice is to buy in the middle-road trims (3.0t) and look for good deals and a dealer who's willing to negotiate. A well-equipped 3.0t model can often be had for under $40,000. Key competitors for the 2017 Infiniti Q50 include the Audi A4, the BMW 3 Series and BMW 5 Series sedans, the Mercedes-Benz C-Class and the Lexus IS. Of these, the BMW and Mercedes options are sportier and much more up-to-date in terms of design and quality. The Audi is cost-competitive to the Infiniti, but not as luxurious, and the Lexus offers the best interior in the business and a far superior hybrid option. It would behoove a smart shopper to cross-compare carefully. Despite its age, we think that the 2017 Infiniti Q50 is still very competitive thanks to its timeless exterior look, excellent interior feel and breadth of engine options. We're big fans of the low cost associated with the high-powered output of the 3.0t model that offers an excellent mix of handling, power delivery and luxury. Interested to see how the 2017 Infiniti Q50 ranks against similar cars in terms of key attributes? Here are the 2017 Infiniti Q50 rankings for MPG, horsepower, torque, leg room, head room, shoulder room, hip room and so forth.